At one time, wood paneling was the norm in home construction. At least the den would receive a treatment of this dark wood with vertical seams. If your home still has some old wood paneling that sticks out like a sore thumb, you can make the paneling look like drywall by following a simple technique. With some time and patience, you can transform your wood paneling so it looks like drywall. Fill in all of the seams of the paneling with spackling compound using the putty knife. Fill in the seams of the paneling until the spackle is slightly mounded at each of the seams. Let it dry according to manufacturer's directions. Sand the spackling compound with fine grit sandpaper. Sand it so that the hardened spackling compound is even with the rest of the paneling. The spackling compound will cover the seam and make the paneling look whole and more like drywall. You may need to repeat Step 1 and Step 2 to fix any imperfections. Pour the primer into the paint pan. 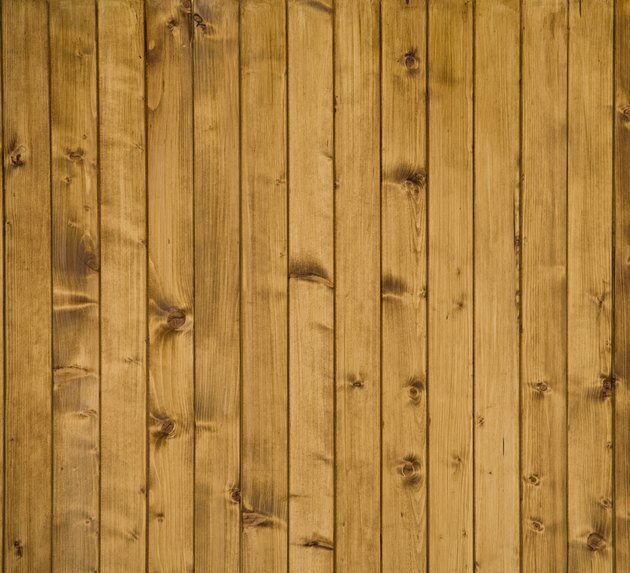 Use a high-quality stain killing primer to cover the wood paneling. Using the paint roller, start painting the wall just like you would paint any wall. As you are painting, look to make sure that the seams are not showing through the paint. If so, the seams will either have to be filled in more with spackling compound or sanded more to be even with the wood paneling. Repeat the priming process with high-quality interior latex paint to make the wall look like drywall. You will probably need to do two coats for best coverage.